Babbel vs. Duolingo: Which Is Better For Learning a Language in 2018? New member special: Get your first 7 days free. It wasn’t too long ago when students who weren’t learning a language in the classroom had to rely on CD’s and cassette tapes. Most of these traditional language learning solutions had to be plugged into your car or your computer, and didn’t offer much engagement. Forward to today, we have several language learning apps that have hit the mainstream audience. These language apps act as a complementary way of learning a language to in-person classrooms or private language lessons. The two most notable ones that people are familiar with are: Duolingo and Babbel. Both of these language apps have their strengths and weaknesses, and our goal for today is to breakdown what these are and offer other alternatives you may want to consider to learn new languages. Structure: Focuses on use of words and some conversation. 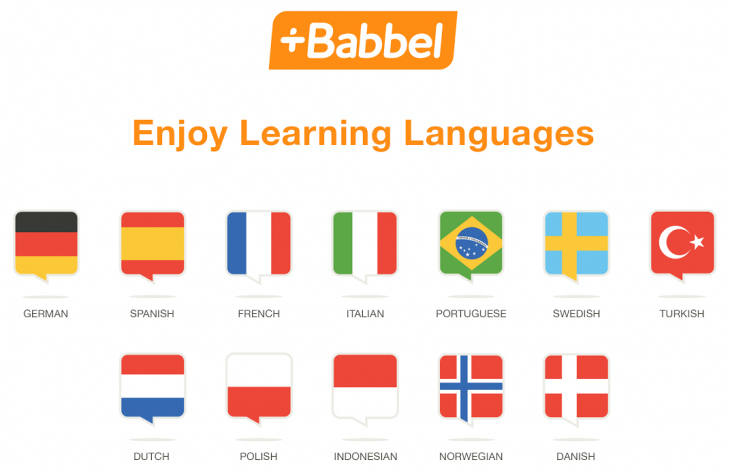 Babbel is a paid language instructional app that offers 14 different languages. Inside Babbel, you’ll find grammar courses, vocabulary lessons, and basic phrases for conversations that are specifically focused on beginners and intermediates. While it is a paid application, it is known to users to be cheaper than Rosetta Stone, which can cost $295+ a year versus the $80-150 cost for Babbel. The company is based in Berlin, Germany. Duolingo is a free language instructional app that offers over 31 different language options for English speakers. Similar to Babbel, you’ll find grammar lessons, vocabulary cards, multiple choice questions, and more. The language app is known to have a stronger focus on building beginner vocabulary and grammar skills, whereas Babbel also helps with basic conversation. As of 2018, the company has over 150MM+ registered users and is headquartered in San Francisco, USA. Let’s go through how Babbel onboards its users when they first get started. Users get started by choosing which language they want to learn, as you’ll be directed to the appropriate language course. The app also requires you to pay per each language, so if you want to learn Spanish and English, you’ll have to pay twice. To determine what language proficiency you have, Babbel asks 5 different questions to better judge what level you are. They appear to have the same format as the lessons inside the language course, but they’re strategically selected to determine your language skills. It’s difficult to determine whether these questions are actually designed for learning your proficiency or whether it’s Babbel trying to gather more data from you. Once you’ve finished the first trial lesson, you’ll be asked to select a paid plan to continue your lessons. As of 2018, Babbel offers 4 different options, including a monthly plan, 3 month plan, 6 month plan, and a 12 month plan. Any payment plan that is not the 1 month will require you to pay upfront. Duolingo offers a free (and optional) proficiency test to get a rough estimate of what your language skills are before you get started. If you’re just starting to learn a new language, this is not necessary and you can just skip this section. Given its main focus on helping language learners develop basic vocabulary, grammar, and sentence structures, you begin the experience by learning new words. After going through a series of vocabulary lessons for your target language, the app will now focus on sentence formations and grammar. They achieve this via fill-in-the-blank questions, direct sentence translations, and matching words together. One of the differences between Babbel and Duolingo is that the latter offers a gamification experience. Some have stated that this is the reason they enjoy learning on Duolingo more, because it feels fun and interactive. This is also a fundamental difference between Babbel and Duolingo. While Babbel has a simple monthly subscription model, where users pay a flat fee to gain access to its language courses, Duolingo is 100% free. Translation: Duolingo users translate new words and vocabulary to learn their target language, and the company sells the translation to major corporations like CNN and Buzzfeed (Duolingo CEO’s answer on Quora). Advertising: As of recent, the company has been focusing more on working on big advertising campaigns with companies like AirBnB, where the cost to participate is $250K minimum spend for one week. Certification tests: They also have a placement test service where users can pay ~$20 to prove their language skills. Paid subscription: As of April 2017, the company started offering a premium subscription service (similar to Babbel) priced at $9.99 a month. Premium users will get an ad-free experience with offline access. It’s still early to say in 2018 what the core business model for Duolingo will become, and we will be sure to update this post to reflect the most recent news. The structure and focus between these two apps are also quite different. Users have stated that while both language apps offer basic grammar and vocabulary lessons for all their languages, Babbel has a stronger focus on conversation phrases. This main feature is what convinces certain users to pay a premium price versus the free version for Duolingo, but it’s debatable whether the cost is justified. The Economist however has had great things to say about Duolingo’s voice recognition software, comparing it to the ineffective technologies back in the day. Compared to Duolingo, Babbel also appears to be buggier with less of an intuitive user experience. Another differentiation to note as mentioned by users is that Duolingo focuses on the semantics of the language including the grammar rules and syntax of the language. On the other hand, Babbel is not focused on that, and has a more straightforward approach to teaching you the language. In conclusion: Is Babbel better than Duolingo? Yes and no. Despite the many similarities and limitations these apps both face, they’re also quite different. From the pricing, instructional focus, structure, and language options. When it comes to third party reviews of Duolingo and Babbel, Duolingo ranks higher by many linguists and language experts. However, several users have commented that you do get what you pay for, and that certain elements of Babbel are better than the free version that Duolingo offers. Our recommendation is that if you’re looking for something simple and easy to start with, give Duolingo a try. We’ve shown you the major differences between the two language apps, and we also covered their major downsides. Neither offer an effective solution for improving your conversation skills nor do they allow you to speak with native speakers to get real-time feedback. In fact, looking at several answers online, most users believe it’ll take them 2-3 years to get to basic conversation level using these apps. This is why we want to share with you what Rype is and how we can help you learn a new language in record time. 5% of what they learn when they’ve learned from a lecture. 90% of what they learn when they teach someone else/use immediately (Rype) In short, according to scientific research, the learning method used for Rype is 4.5x more effective than Babbel and Duolingo. While Babbel and Duolingo relies on a ‘one-size-fits-all’ curriculum that is standardized for everyone, Rype offers a fully personalized language program based on your specific needs, goals, and level. This allows you to only learn the materials that you care about, and what will help you reach your goals faster. In other words, no more wasting time on learning nonuseful things, so you have more time for things you actually enjoy. We hope this breakdown between Duolingo and Babbel was useful in helping you make a better decision. As we mentioned, both apps have their strengths and weaknesses, and are known to be useful complementary tools for working with private teachers. If you’re ready to accelerate your results to speak a new language confidently, Rype offers a risk-free trial for new members which you can claim today. Or learn how it works here. If you still have questions, email us at anytime: help@rypeapp.com. We can’t wait to have you inside our family.